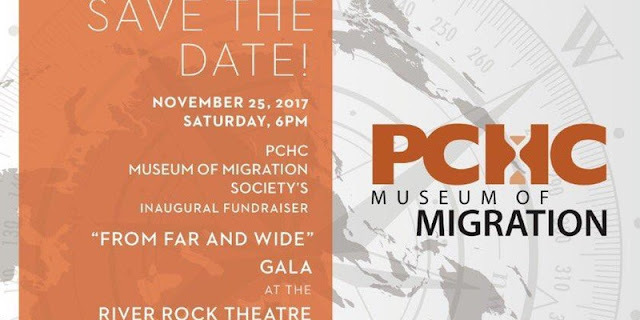 The Pacific Canada Heritage Centre – Museum of Migration (PCHC – MoM) Society is a non-profit society incorporated to build a wider and improved understanding of Canada’s history and growth through intercultural explorations of historic and current trans-Pacific immigration. Its mission is to establish a Museum of Migration at a site of historical significance for Canadians whose families first arrived in Canada through its western portals, and to create a supporting national research network for an interdisciplinary and more inclusive interpretation of Canada’s history. A table for ten guests at $150 each includes a fabulous dinner and dessert, inspiring stories, entertainment, a lucky draw for a major prize, dancing, and featuring our headline show with CBC Host and Comedian Ali Hassan. We have been functioning as a "museum without walls" for five years, offering educational programs with partners across the country mainly through the dedicated team of volunteers based in Metro Vancouver without any formal fundraising so far. Now we would like to give you a comprehensive report and celebrate our progress at our first fundraiser -- From Far and Wide Gala -- on Saturday November 25, 2017 at the River Rock Theatre in Richmond, BC. All proceeds will be used to advance our mandate and to realize our dream of building a physical hub where Canadians can discover and share their family histories and more.